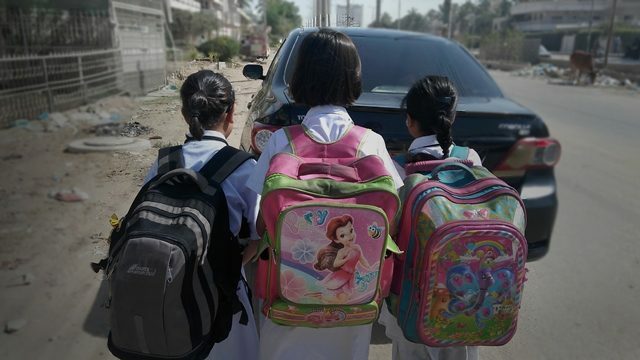 Two weeks ago Khyber Pakhtunkhwa’s school department began to take notice of heavy school bags. It wanted to study how backpacks are ruining a child’s spine and skeletal growth. This is not just something that parents in KP worry about. The American Academy of Orthopedic Surgeons recommends that the weight of a school bag should be less than 10% or 15% of a child’s body weight. “Improperly used school bags may injure muscles and joints and can lead to severe back, neck, and shoulder pain, as well as posture problems,” an orthopaedic surgeon and spokesman said. Most students have never thought this was a problem. Maryam Noor, a student of a renowned English medium school, was initially stunned with questions about her bag. She said it did exhaust her and cause pain. If a student has a heavy bag, their entire body is pulled backwards. To compensate for this, the child rounds their back forwards to lean ahead to balance the weight. This causes neck, back, spine, shoulder and joint pain. Their head also strains forward. All of this is made worse if a child has to climb stairs in school. This makes it harder for muscles and ligaments to hold the body up. Shoulders are also not something meant to hang things from. A heavy load places too much stress on them. This alters the bio-mechanics of the body. The hips can become sore as well as their body tries to adjust to the weight. The knees are affected as a child walks differently with a heavy bag on their back. Parents argue that extra books should be kept on campus. Another option is to let the child keep them at home if they are not needed in school. Look at how your child hoists their bag on to their back. Is it difficult to do? Do they have red marks on their shoulders from the straps? Do they complain of numbness? Fitted backpacks with a waist strap are recommended. The bag should be the length of the torso and its bottom two inches below the waist. I’m would suggest Ministry of Education to implement laws to curb this practice. Italian fitness trainers answer the age-old question: can you really lose weight in 30 days?